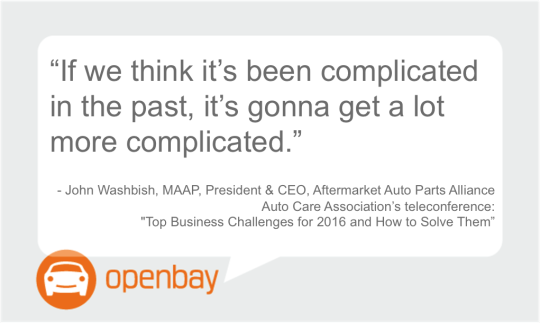 John Washbish, MAAP, president and CEO, Aftermarket Auto Parts Alliance. Mark Seng, MAAP, global aftermarket practice leader, IHS Automotive. Malcolm Sissmore, sales director, Delphi Products & Service Solutions. We highly recommend listening to a recording of the talk, but until then, here are the notes we’d taken on some interesting trends, facts and challenges for the auto care industry in the years ahead. Age: The average age of the U.S. vehicle fleet has increased 17 percent in the last ten years. Ownership: The average length of vehicle ownership for new and used vehicles has increased 60 percent in the last ten years. Work: 75 percent of aftermarket auto repair is performed by independent auto repair shops, while 25 percent of the business lives with dealerships. Gas/electric: Over the next five years, hybrids and electrics will increase, but not at a great rate within the next 5-10 years. Those vehicles are concentrated largely in pockets, as long as government rebates exist. Outnumbered: “In the U.S., there are 1.1 registered vehicles for everyone over 16 years old. We have more cars than we have licensed drivers,“ said Washbish, citing IHS research. ‘Sweet spot’: The “aftermarket sweet spot” refers to those vehicles that are driving the most aftermarket repairs. 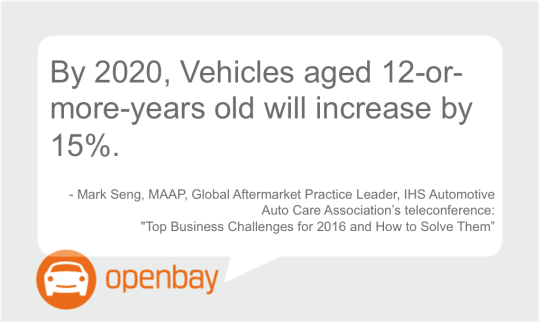 By 2020, there will be about 76 million units of vehicles aged 16+ years. Vehicles that are new to 5 years old will increase by about 24 percent. Vehicles that are 6-11 years old will decline by about 11 percent. Vehicles aged 12 or more years will increase by 15 percent. Imports: Imports are growing. Today, 57 percent of vehicles on the roads in the U.S. are domestic. By 2020, that will be reduced to 53 percent domestics. Imports will grow from 43 percent to 47 percent – there are now about 111 million imported vehicles on U.S. roads, and by 2020, that will look more like 122 million units. 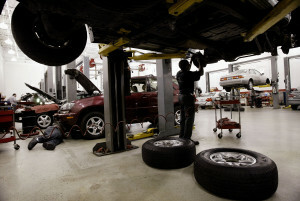 Franchises: There’s a trend toward large franchise auto repair businesses, which have smaller shops rolling up into them. That’s a good opportunity for profitable businesses on the service/seller-side. Parts: The aftermarket world is going online, and the marketplace is changing. Parts are being sold online, service is being sold online. 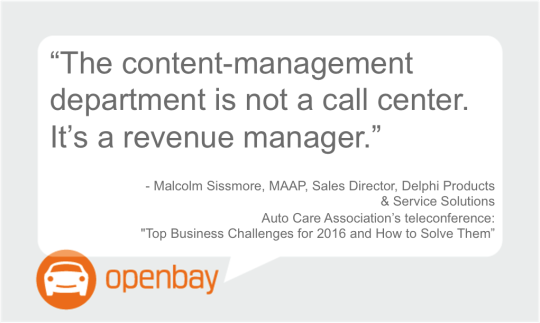 Telematics: By 2020, 80-90 percent of all new vehicles will have embedded telematics. Powertrains: There will be major changes in powertrains. Turbochargers have increased in popularity, and you’ll see that explosion continue. Four-cylinder turbos are delivering manufacturers with the fuel efficiency they need, without having to rely on hybrid and electric vehicles. The trend toward turbos is favorable for the aftermarket, noted Malcolm Sissmore, because “turbochargers require spark plug changes about 2-3 times more often than naturally aspirated” vehicles. “At the same time, those little engines have a lot being asked of them, and could see premature failures, and if that happens out of warranty, that’s also good for the industry,” he said. China: “China is an explosive market, where 4.3-years is the average age of a car. There’s only one car for every 117 people. If you want to do something new, go to China,” said Washbish, citing IHS research. E-tailing: “It will go in that direction,” said Seng. “In this world, data is king, more so than it is now. Information on the supply chain, up-to-date pricing, discounts, pictures, and all the stuff that sells your brand” beyond what competitors offer, is key. The shifting fleet: By 2020, it will have to provide parts and service for 76 million vehicles aged 16+ years old. By 2020, there will be a shift toward more domestic vehicles. Will those shops that typically service domestic vehicles be ready, or perceived as ready, to service import vehicles? Training and marketing may be necessary. Telematics: As telematics are increasingly embedded in new vehicles, the auto care industry faces a dilemma similar to that posed around the “Right to Repair” bill – who has access to that data? Training techs in telematics, having the right parts on the shelf, and marketing your shop’s competency to service sophisticated newer vehicles will be increasingly important. “I’m bullish on the aftermarket to be able to do it again with this new technology,” said Seng. Inventory: Inventory selection and control will become increasingly important and key to success. Shortage of techs: With millions of retiring shop techs, there aren’t millions taking their places. The Auto Care Association has taken a proactive approach with its newly created job board. And universities, such as Northwood, are focusing on STEM courses, working with manufacturers. The industry must remain active in its approach to filling the pipeline of automotive technicians.